After many years as a professional photographer Neil White created the original concept of using the sunrise as a memento to remember "The First Day" . The first day of the rest of their lives. Neil realized this concept with the birth of his first nephew in August 1995. 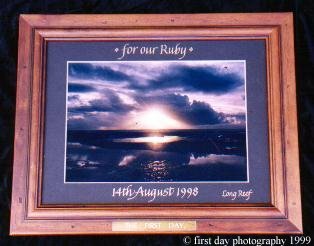 The gift of a framed photograph of the sunrise on the actual day of the birth of Neil's nephew and nieces was a great hit. Soon many friends and family were asking Neil to take the sunrises for their special days too. Q. What is the authenticity of each date ? Q. How is the authenticity of each date shown ? Q. Are the sunrises taken on film or digital camera ? Q. Are your digital images photo-shopped ? Q. Why is each day a different location ? Q. Can I request a particular location ? Q. Why are some days grey ? Q. What if its raining ? Q. Why are there days missing in the early years ? Q. How long will the sunrise print last ? Q. Tell me about the calligraphy ? Q. Are there any limitations on the calligraphy ? Q. Aren't you a bit expensive ? Q. What warranty or guarantee do you have on your products ? Q. What if the product is damaged when delivered to us ? We will than happily replace your sunrise for you..
Q. Is my privacy protected ? Q. Will your oldest dates remain the same price as current dates ? Q. Has a day ever been missed ? Q. Do you ever get tired of getting up so early every morning ? Q. Will a budget product be introduced ?